WataugaWatch: Thom Tillis Is Uncomfortable with Virginia Foxx ... But Then, Aren't We All? 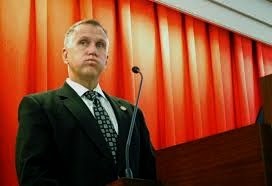 Did you see that Brant Clifton unearthed Civitas's grade of "F" for Tillis in its 2010 ratings of the General Assembly. That was before he was elected Speaker. He ain't no conservative! Sadly for the people of North Carolina, neither Tillis or Foxx ever seem to take their stupid hat off.